We are so thankful to have an upgraded master bathroom. When we moved in, it was in terrible shape. The tile was cracking and yucky. All of the fixtures were wearing brass and worn down (but not in a good way.) The shower was enclosed like a dark cave with beige tile that was cracked in places. 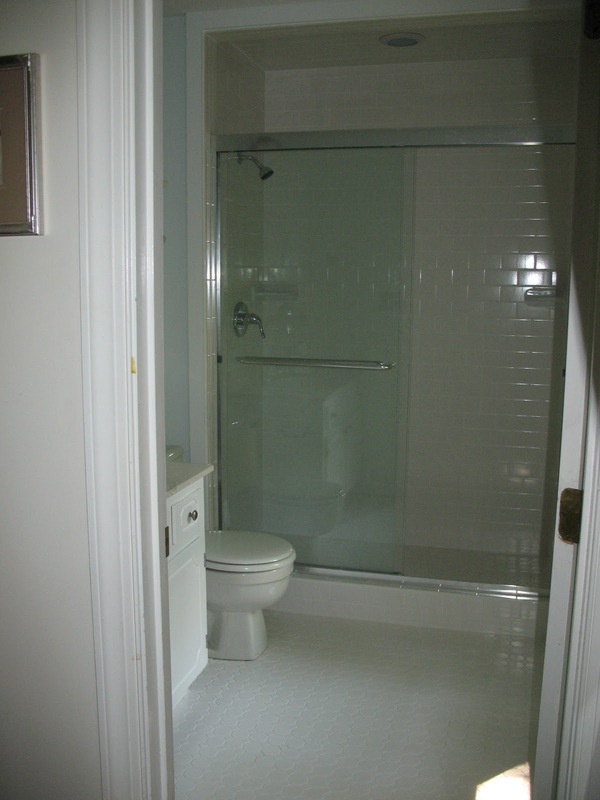 It wasn't until an unfortunate plumbing disaster that we were able to upgrade it. The pipe burst open one night behind the shower wall flooding in between the wall and down into our crawl space. Luckily we were home when it happened and figured out quickly to shut off the water to the house. We were so fortunate to have a home warranty plan that was purchased by the sellers of our house. The warranty covered the plumber fixing the pipes in the wall. And because the plumber had to tear out a significant portion of the tile that was irreplaceable due to how old it was our home owner's insurance paid for the cost of the entire shower to be fixed. 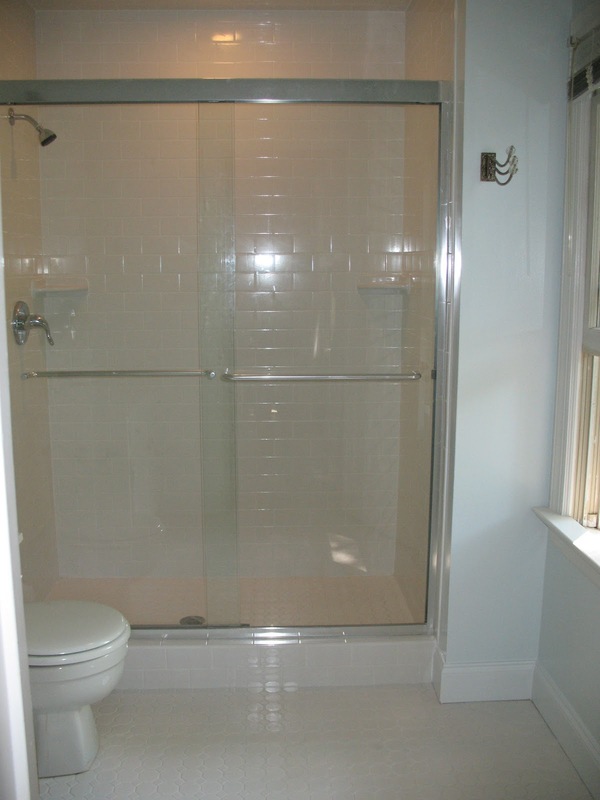 We hired a wonderful company to fix the tile in our shower, but instead got an entire new bathroom. 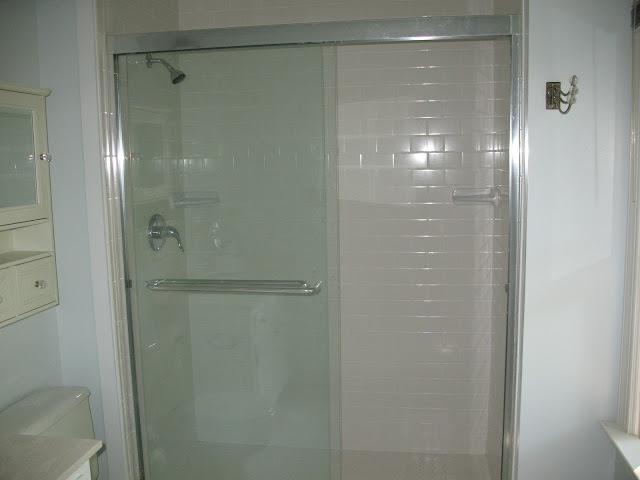 Instead of just replacing the tile that surrounded the shower, it was an equivalent price to knock out the wall and replace it with a glass shower door. Perfect. This really opened up the bathroom and made the shower feel less cave-like. We were actually on a trip to Denver when we were getting our bathroom fixed, which was nice. 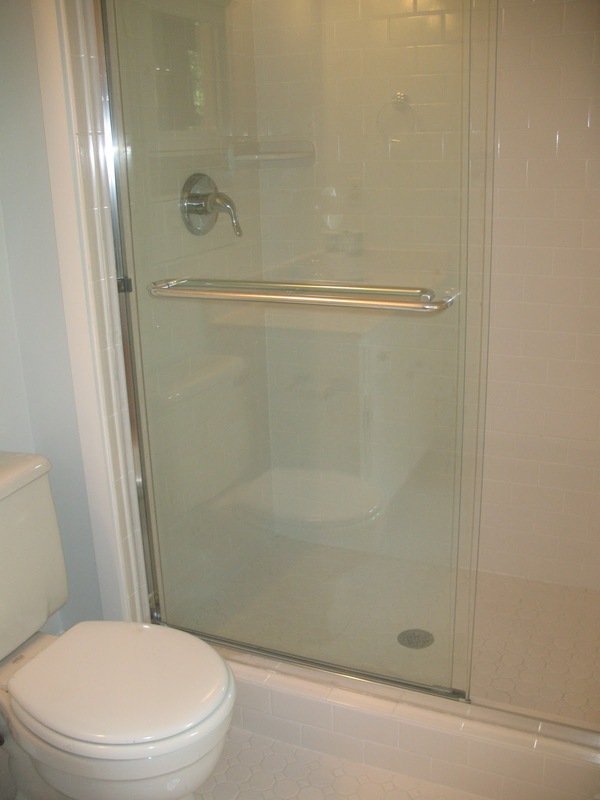 However like most contractors we've dealt with it took a little longer than the one week quote. It took about 2 weeks to have it completed. 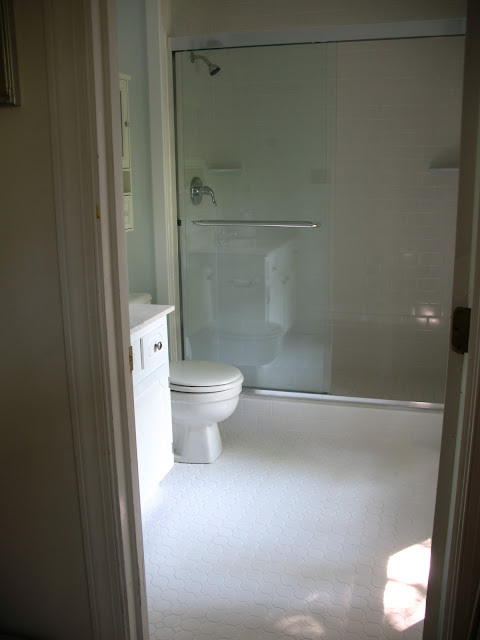 But here's what we were left with, and we couldn't be more happy with the finished bathroom. For the tile in the shower we chose a classic white subway tile. This sort of tile will never go out of style. 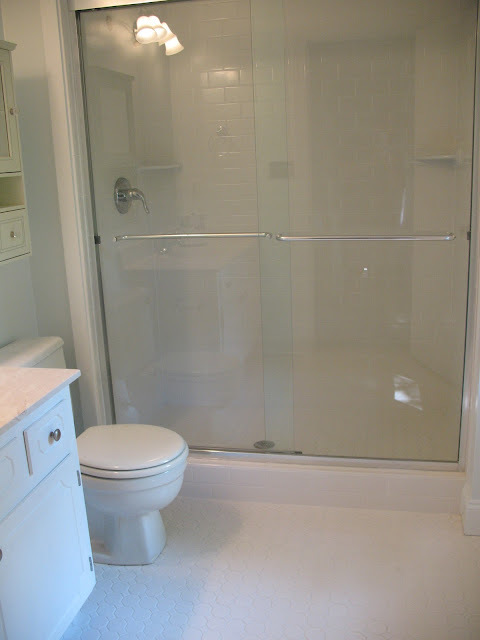 For the walls we chose a paint called White Sapphire by Behr. We chose to have the floors replaced as well, but this came out of pocket for us. The entire subfloor was replaced as well. 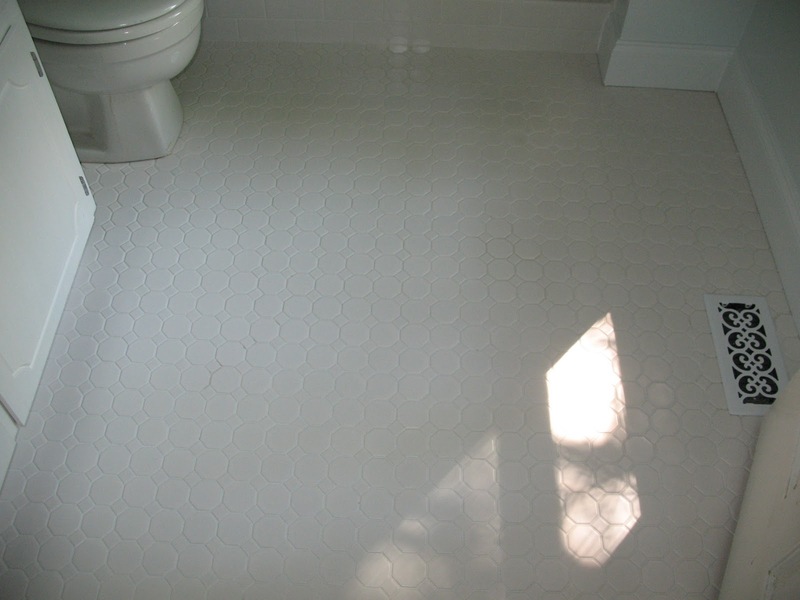 We chose an octagonal honeycomb shape tile floor in white with white grout. 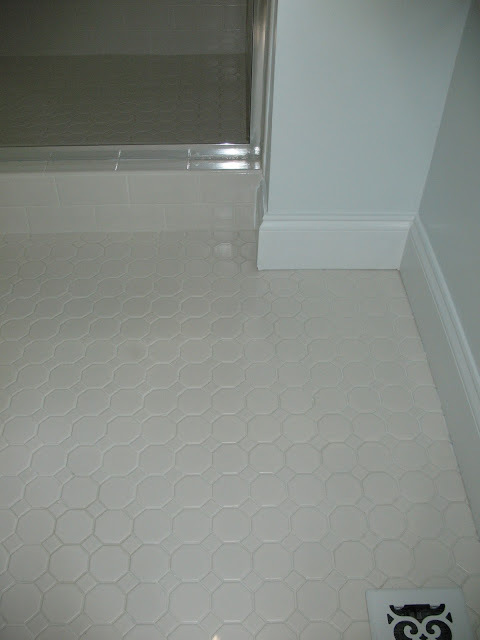 We may later regrout the tile with a gray grout just to bring out the pattern and to hide dirt. The floor vent was replaced with a white metal floor vent. 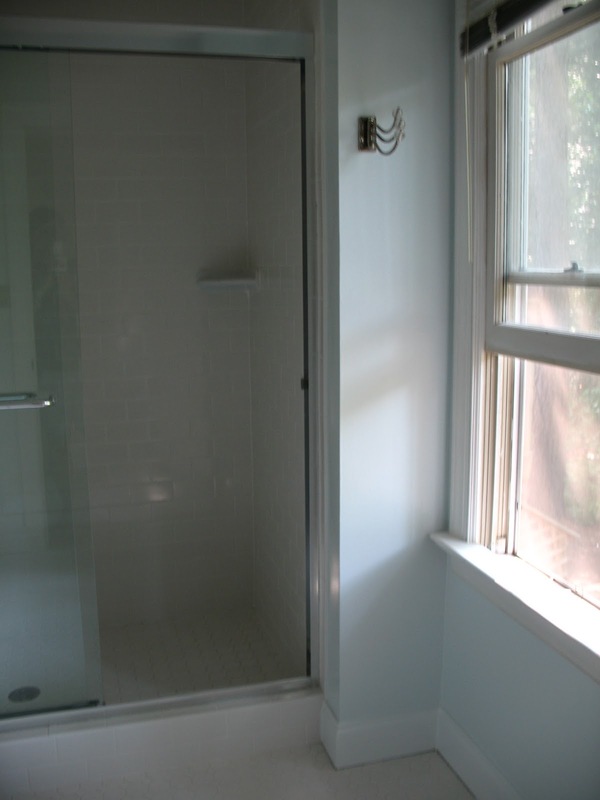 The facet and shower head were replaced in new chrome finish fixtures. You can't see it in this pic, but there is also a ceiling light that was replaced. It's nice to have that extra lighting in the shower. The three little robe hooks on the right were purchased from Home Goods. Here's a close up of the floor tile. Ah, don't you love a clean and new bathroom? 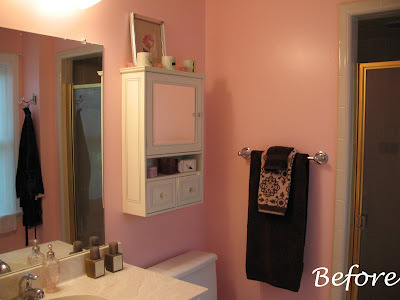 Send us your before and after bathroom photos. We'll share them on our blog. What an amazing transformation! The floor tile design is just spectacular. It's the perfect complement to your toilet and shower. I can't wait for our boiler repair contractor to finish. 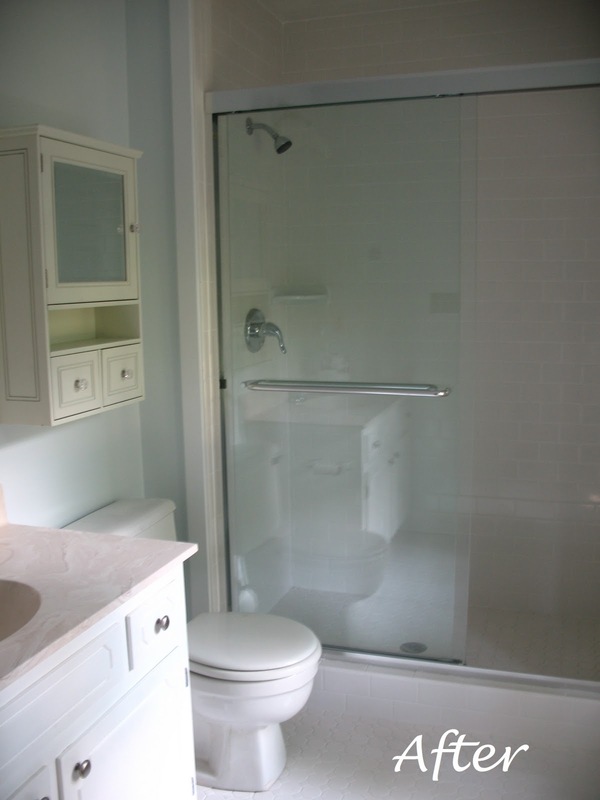 One of the bathroom fixtures that I love in this post is the glass division of the shower and toilet. It makes the room more spacious.